In this high-adventure sequel to the smash-hit Baby Geniuses the baby geniuses find themselves at the center of a nefarious scheme led by powerful media mogul Bill Biscane (Jon Voight). Joining the babies in their battle against evil is a legendary baby named Kahuna. Part ultra-cool spy, part superhero, Kahuna joins babies Archie, Finkleman, Alex and Rosita in a race against time to stop the villainous Biscane from using his state-of-the-art satellite system to control the minds of the world's population. $3.251 million on 1276 screens. On the cover for the DVD of Superbabies: Baby Geniuses 2, we find the statement that “America’s favorite talking babies are back!” That seems like a big claim for a movie that made $9 million at the box office, especially since the original flick only took in $27 million. Admittedly, the franchise doesn’t have a lot of competition for the title of “America’s favorite talking babies” due to the fact we’ve not gotten a new Look Who’s Talking effort since 1993. Still, I’d like to see a franchise take in more than $36 million total before I’d call it America’s favorite anything. 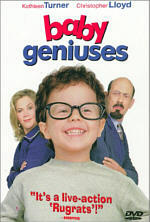 However, Baby Geniuses may be Colin’s Favorite Cheesy Kiddie Fare to Hate. The original movie was absolutely atrocious, so I knew I had to check out the sequel to see if it lived up - or down, as it were - to the older flick’s standards. Proof that the story is incoherent comes from this synopsis. Even it’s not accurate, as it gets a number of plot points incorrect. My guess is that someone tried to create an accurate summation but couldn’t figure out form of logic from the tale so they just cobbled together some random elements. Or maybe they just said “who cares?” and left it at that. I can’t blame anyone who feels that way. As bad as the first movie was, at least it operated from a semi-intriguing premise with its concept of decoding baby talk. Okay, “semi-intriguing” is an overstatement, as the original’s tale was little more than an excuse for wacky shenanigans, but at least the film sort of kind of almost tried to create a plot. That’s as close to praise as I can ever offer for Baby Geniuses, which deserves no accolades. In comparison with Superbabies, though, it looks much more interesting and coherent. This movie’s so absurd and poorly-made that it doesn’t even turn into good fodder for mockery. Geniuses poured on the cutesy montages. I hate that crap, but I suppose it entertained the same people who liked the Dancing Baby and other such nonsense. Superbabies includes some of those sorts of shots, but mostly it just meanders from one pointless situation to another. No real attempts at storytelling occur. Yeah, there is some sort of plot, but as I noted, it makes no sense, so the movie does little more than present largely unconnected little scenarios. One minute we get wacky action sequences, and then we shift awkwardly to teen romance. Frankly, I often got the feeling that the filmmakers took whatever the child actors gave them and tried to cobble it into a story. A lot of the material just seems so incongruous. For example, toward the end, the bouncy baby takes a drink of water and pours some over his head. This doesn’t connect with the tale at all, so I’d guess that the kid did it on his own, someone thought it was cute, and into the movie it went. The flick tosses in strangeness like Kahuna’s “origin story” as well. This creates a really creepy element, as we find out that Kahuna’s not a kid - he’s over 70 years old and kept in a permanent state of childhood due to a chemical formula. The movie wouldn’t make any sense, but this just seems disturbing. And nonsensical, as well. I guess the filmmakers felt they needed to make some explanation for Kahuna’s abilities, but couldn’t they have come up with something better than that? And why did they need to use the kids who played Sly/Whit from the first movie in the role? There was no reason to connect Kahuna to those characters. It’s official: Jon Voight will do anything for a paycheck. How is it possible that he once was regarded as one of the premier actors? No, he’s not the first to slide down from the highest highs, but his appearances in miserable efforts like Superbabies, Anaconda have nearly turned him into a laughingstock. At least Voight tries his damnedest to evoke some entertainment. He overacts relentlessly and seems about to blow a gasket at any moment. Occasionally he almost provokes a little amusement, but he doesn’t quite succeed. The other actors don’t do anything well. The fact that all the babies had to be dubbed by others makes their sequences stilted and artificial. Oddly, even another actor does all of Kahuna’s lines for the Fitzgerald boys. The kids must be six or seven by now - they couldn’t read their own material? It doesn’t help that the lines integrate poorly. 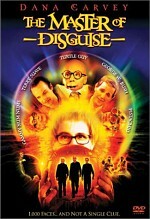 There’s lot of bad looping in this flick, even from the actors who speak their own lines. I thought the visual effects of the first film looked pretty good, but they’ve not progressed over the last five years. Those shots consistently seem cheap and fake here. Honestly, Superbabies is such a bad movie that it’s not even entertaining as cheese. At least the first one was fun to hate, whereas this one’s just boring. It fails to create an even mildly coherent story or to present anything fun or entertaining. Superbabies: Baby Geniuses 2 appears in an aspect ratio of 1.33:1 on this single-sided, single-layered DVD; due to those dimensions, the image has not been enhanced for 16X9 televisions. I didn’t realize Superbabies would be pan and scan until it arrived, as I assumed it’d be widescreen like the vast majority of DVDs for modern flicks. I also didn’t know it’d be such a bad crop job. The first movie was fullscreen as well, but at least it didn’t chop much since that flick was 1.85:1. I support original aspect ratio across the board but don’t find movies that zap 1.85:1 down to 1.33:1 to look too wretched. However, Superbabies was 2.35:1 in theaters. We see this during a brief letterboxed segment in the opening credits, and it seemed obvious as I watched the movie that it’d been cropped badly. This created an unnatural sense of framing from start to finish. Even when I ignored the poor chop job, the image of Superbabies showed problems. Sharpness was erratic. Most shots looked pretty concise, but more than a few exceptions occurred. Occasionally the movie turned somewhat soft and ill-defined, and without much logic. Usually I see most of the problems in wide shots, but here the softness popped up without much rhyme or reason. The lack of definition wasn’t terrible, and most of the movie looked fine, but the softness did create some distractions. Some problems stemmed from edge enhancement. The haloes never became severe, but I saw them with moderate frequency and intensity throughout the movie. I also noticed some jagged edges and a smidgen of shimmering. As for source flaws, the film demonstrated a few speckles, but mainly it seemed too grainy. I figured that a lot of that resulted from issues connected to the pan and scan job, as that technique blew up the original 2.35:1 image. Whatever the case may be, the grain created an occasional nuisance. As one might expect from a cartoony kiddie flick, Superbabies went with a broad palette, and the DVD usually replicated the tones nicely. At times the colors became somewhat runny and messy, but not with much frequency. Instead, the hues mostly appeared bright and vivid. Blacks were more problematic, as they seemed a bit flat and drab. No such problems accompanied the Dolby Digital 5.1 soundtrack of Superbabies, though a few concerns arose. It offered a moderately effective piece of audio, though not one that ever threatened to stand out from the crowd. While the first flick featured a fairly hyperactive soundfield, the sequel went with a more subdued mix. Most of the audio remained focused on the forward channels. They displayed reasonably solid stereo imaging for both music and effects. The various elements were appropriately placed and demonstrated good movement and integration. Despite the movie’s goofy action sequences, the surrounds didn’t receive much of a workout. On a few occasions, they popped to life and let some elements like the bouncing baby or aircraft zoom around the back of the room. However, they usually stayed with general ambience and did little to strongly enhance the film. With one notable exception, the quality of the audio remained positive. As I noted in the body of my review, Superbabies featured lots of bad dubbing. Speech always was intelligible and clear, but it also sounded artificial and integrated awkwardly. There was nothing particularly wrong with the original recordings; they just failed to mesh with the action, so they caused me to knock down my grade somewhat. Otherwise, the sound quality was fine. Effects demonstrated good accuracy and heft. The mix never threatened to punch a hole in my wall, but it kicked in decent vivacity when necessary. Music showed nice range and dimensionality. Again, nothing here really impressed me, but except for the weak dubbing, the overall package came across as more than acceptable. Almost no extras accompany Superbabies. We only find a collection of Previews. This area includes trailers for Superbabies, Baby Geniuses, Daddy Day Care, Jumanji, Master of Disguise, Matilda, and Soccer Dog: European Cup. Cheap, cheesy, and thoroughly boring, Superbabies: Baby Geniuses 2 offers a sequel to a movie few saw and fewer liked. It’s not as aggressively annoying as the original, but it compensates with an even more nonsensical story and a genuinely unexciting tale. The DVD presents mediocre picture marred by a pan and scan transfer. Audio seems fairly decent, but the DVD lacks any real extras. A weak DVD for a bad movie, Superbabies doesn’t deserve your time or money.